Getting to know the island of Bali is not only a stunning tourist destination. However, on the other hand, Bali became very famous for its local culture as well as its unique and interesting religious rituals. Examples of one of which is building a temple built with traditional Balinese architecture. Very beautiful and also interesting to look at, not to mention the ritual form that makes many tourists interested to see. The term of the temple with the understanding as a holy place of worship of Balinese Hindu society was used after the dynasty of Kresna Kepakisan which resided in Klungkung around the XVII century. Each temple courtyard is bordered by a circular wall with a temple bentar entrance that lies between the outer courtyard with the central courtyard, and the grand chorus or bracket temple as the middle page link with the inner page. The temple is symbolic of mountains. God, the gods, and the holy spirit of the ancestors are considered residing on the top of the mountain, so the mountain is seen as a holy place. Pura as a holy place, as well as Panti, Pemerajan, Pedharman, Kahyangan Tiga, Sad Kahyangan and others is an important part of a “Body” society. Such places not only have an important position but also have a central function for the dynamics of community life in intent, for culture and also for the civilization of that society. It is one of the importance of the temple in Bali which is very sacred. As the most widely practiced religion in Bali, Hinduism is one of the religions that is still glorified by Balinese people. In every Balinese house, there is a temple or so-called Pura as a place to perform Hindu worship. This temple has a great religious value, and also has a very unique building form. Therefore the temple is used to perform religious rituals that are highly respected Balinese generally. One of the things that became the importance of the temple in Bali is the temple building. This building is not only a unique shape but has a philosophical value for all citizens of Bali. From the shape of the building and also the meaning of the religious ritual has a sacred content value and also great. In every Balinese temple-making, all elements are based on philosophical value and also have sacred religious values and godly values. So it is not only beautiful to look at, besides pretending to have custom and cultural value which is very interesting to know more deeply. One thing that becomes the importance of the temple in Bali is Pura building is a very interesting cultural heritage building. The architectural style is very unique, making the temple a prima donna for local residents and also tourists to enjoy its beauty. One of the virtues of the temple is considered as a cultural building and deserves to be preserved. Because in Bali itself its citizens are very respectful of this building as a holy place and also a place of worship. As a place of worship and also perform ritual activities of Hinduism. 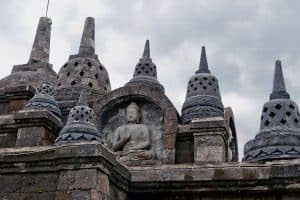 Pura is much used as a center for the development of Hinduism itself, every citizen of Bali to worship and also the search of knowledge both to God and to one another in Pura. Every activity undertaken in Pura is all done in a way that is obedient and also polite. No one should wear clothes to enter this place. Everything is set up to honor the Gods and God. One of the importance of the temple in Bali is as a place of worship as well as a place to connect silahturahmi ropes among the citizens of Bali. At the time of worship as well as performing religious ceremonies, the Balinese come to offer and pray. In this place as a place to gather and meet every citizen as a connector silahturahmi. In Bali, the Brotherhood feels very high, as evidenced by the mutual cooperation between residents in every village or village and also in the city. In Pura, many religious activities, one of which is a religious ceremony and also a traditional ceremony. Every religious ceremony performances of all citizens of Bali prepare a dish or offerings are intended as a symbol of delivery to God, god and ancestral spirits. Each dish is beautifully arranged, neat and also various types of fruits, vegetables and some forms of food. This dish has a sacred and mystical value, so it should not be carelessly eaten or taken away. As the importance of the temple in Bali, the temple is believed to be a place for the spirits of the ancestors. Not only as a place to glorify God and the gods, the ancestors who lived in the Temple were also given a special place in remembering and remembering their good deeds. As a holy place and also great, Pura is a safe place for the ancestral spirits are revered and also remembered. So many Balinese pray at Pura also to pray for their ancestors to live in peace and to live their paradise. For Bali, Pura is a place other than to pray and worship can also be used as a place to meditate. When experiencing difficulty in life and want to reflect, Pura becomes one of the options for meditation. Every meditation has a good purpose because it connects a prayer to God and also to the universe. So that self-feel calmer and also more obedient. In addition, the aura of the temple is very quiet, peaceful, and also shady it is advisable indeed to meditate and pray. One of the importance of the temple in Bali is to become a place for people to be better at doing self-improvement among others as well as to themselves. By performing religious rituals and rituals frequently, each person’s spiritual will experience a change for the better. So hopefully that person can be a useful self to his fellow and do many right actions. With worship and praying at Pura, of course, the heart and mind become calmer and also directed. Jaba Pisan or Nista Mandala is the outermost part of the temple. The non-sacred part of a temple, because everyone can enter this area. Usually used for art and kitchen stalls where the offerings are made. Jaba Tengah or Madyani Mandala A part of a sacred temple. Usually, here the people are already focused to face Sang Hyang Widi Wasa (God in Hinduism). There is also a place to store things and there is also a hall where the gamelan. Offal or Main Mandala. The deepest and the holiest or the sacred. The people who enter this area must really focus and renounce the world to face Sang Hyang Widi Wasa. People usually enter from the door at Kori Agung whose door is purposely made small so that it can only be passed by one by one by the people. Thus the explanation of 13 the importance of the temple in Bali. Hopefully useful and to meet again next.